What is a Board Certified Criticalist? Criticalists are specialists with advanced training in the management of life-threatening conditions and therefore see pets with a wide range of problems, from genera; emergencies to critically ill animals recovering in pet ICUs. To be a boarded specialist, applicants undergo an intensive three-year residency program approved by the American College of Veterinary Emergency and Critical Care (ACVECC), publish in a peer-reviewed journal, and pass a rigorous board examination. Upon successful completion of the training and passing of the examination, the veterinarian is a Diplomate of the ACVECC (a DACVECC), is termed a “specialist”, and is board-certified in veterinary emergency and critical care. Pets are often a part of the family, and it can be very frightening when a beloved family member has a life-threatening illness or injury. Criticalists work alongside emergency veterinarians, other specialists, and primary care veterinarians to ensure the best outcome for your pet. Common problems that may benefit from a criticalist include severe trauma, difficulty breathing, shock, collapse, sepsis (severe, overwhelming infection), traumatic brain injury, protracted seizures, acute organ failure, or difficulties recovering from surgery or anesthesia. Critically ill pets often need to be hospitalized, and receive many of the same diagnostics and treatments that people receive in human ICUs. These can include continuous blood pressure and heart monitoring, acid-base and blood gas analysis, blood transfusions, blood pressure support, oxygen supplementation, aggressive multimodal pain control, specialized nutritional support, and life support modalities such as dialysis and mechanical ventilation. Our emergency department aims to provide initial stabilization and advanced life support of critically ill and injured patients in conjunction with other specialty departments within the hospital. Our emergency department is staffed with skilled and dedicated emergency doctors and certified technicians who are well versed in the acute resuscitation of trauma patients as well as pets exposed to toxins and infectious diseases. They will provide peri-surgical and anesthetic support as well as intensive management to hospitalized patients including continuous monitoring, blood pressure support, fluid therapy, transfusion medicine and advanced pain management. The team is dedicated to treating life-threatening conditions and is available 24/7. 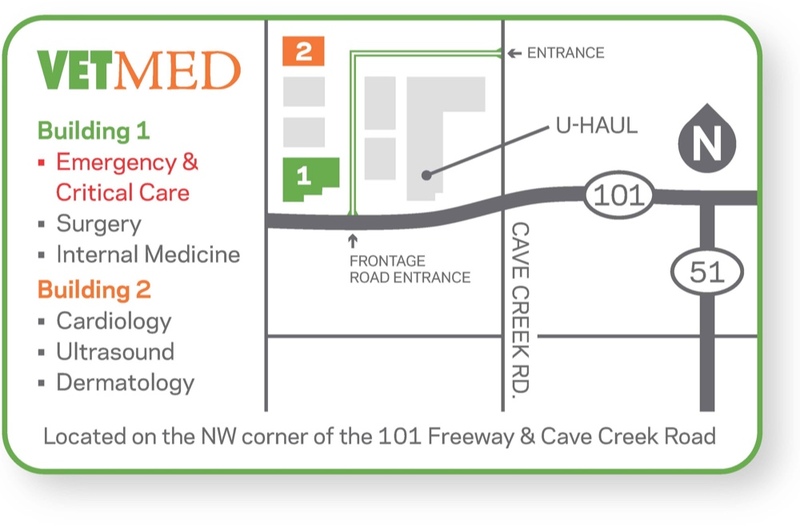 We are available anytime for inpatient or outpatient care.